The capsules compatible with Lavazza a Modo Mio systems available at MaxiCoffee are selected based on two simple ideas : combining the best in cup result while ensuring the complete compatibility with your Lavazza a Modo Mio machine. 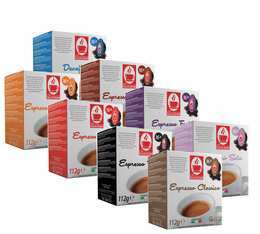 Our capsules compatible with Lavazza a Modo Mio ensure high quality coffee, at the best prices, and offers a large range of drinks : coffee, decaffeinated, cappuccino/latte, etc. These compatible capsules represent a great alternative to the original capsules manufactured by Lavazza! 16 x Gran Riserva Intenso capsules - Caffè Corsini for Lavazza A Modo Mio capsule machines. 16 x Gran Riserva Arabica capsules - Caffè Corsini for Lavazza A Modo Mio capsule machines. 16 x Gran Riserva Vellutato capsules - Caffè Corsini for Lavazza A Modo Mio capsule machines. 16 x Gran Riserva Decaffeinated capsules - Caffè Corsini for Lavazza A Modo Mio capsule machines.